If you feel like adding a bit of slither and slide to the day, our snake birthday party upgrade will be just the ticket! Hugely popular with our parents and birthday boys and girls, with this package we’ll bring our super-exclusive guest along to meet everyone. 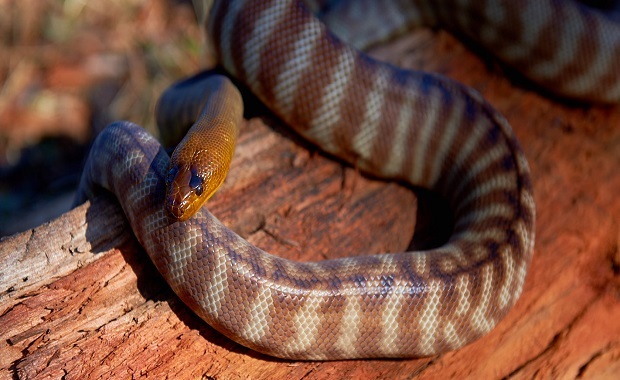 Our wonderfully mesmerising Woma Python, Cinnamon, is sadly on the critically endangered list, so we’re extra passionate and proud to introduce her to your guests and educate everyone about her difficult situation. And as you’d have to drive the party for 1100 km to see her in the wild, bringing her to your house might be the sensible option! With a beautiful combination of golden brown, olive and grey scales, alternating with dark rings, it doesn’t take long to figure out why she is so charming! Cinnamon is a truly stunning snake. As well as her looks, she is renowned for having a pleasant and docile personality. Although this might change when she feasts on rabbits or lizards, two of her favourite snacks! Like most of the extremely cool party guests we’ll be bringing, she is native to our very own Australia and you might spot her in Western Australian, Northern Territory, Queensland or Southern Australia. You may even find one of her sisters basking in the New South Wales sunshine! As a parent we would totally understand if you’re thinking, “well, she sounds lovely, but is she actually safe to have around excitable kids? !” … Well, the short answer to that is “Absolutely!” We have been in business for over a decade and really do know our stuff. 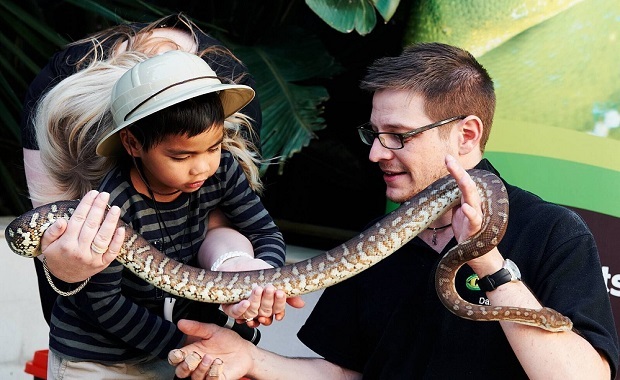 Our snake parties are totally safe for kids and adults alike, and our Wildlife Ambassadors exceptionally well-drilled in handling as well as educating. This means every single guest who wants to can touch her! Better still, no matter how high on sugar the ankle-biters are, you can chill out safe in the knowledge we operate smoothly in an environment of complete safety. Monty, our lovable Carpet Python is another headturner! Also known as “Morelia spilota”, this looker boasts beautiful patterning of olive, black and cream, mixed with glimpses of gold. Despite the name, Monty and his family of Carpet Pythons are actually skilled climbers, spending half their time in trees, and slithering down to the ground when hungry for a bird, rat or lizard. These make up most of their meals, although they have occasionally been known to munch on cats and even tiny dogs. Eek! But there’s no need to worry for your pet’s safety, Monty is mega-friendly… we promise! You’ll be hard pushed to see one of his wild brothers here in Victoria, but they can be found in most other territories across Australia, so we’re proud to say he’s yet another fantastic example of our wonderful native reptile population. Mummy Carpet Pythons can lay up to an incredible 50 eggs at a time then keep them warm by coiling around them and contracting their muscles. Cool, huh?! Don’t forget, also joining the party will be all hippest guests in town included in our standard package (full list below). Just to whet the appetite, we’ll provide you with the grooviest reptile themed party invitations you can imagine! And why not sprinkle a little gold dust on what’s sure to be a magical day by ordering some snake plates and napkins? Or if you fancy yourself as a little bit of a Gordon Ramsay, take it one step further and by rustling up some snake party food for the little critters?! A VIP appearance from our one and only Woma Python!